Sepia Saturday 264 : North-East To Tonsberg. Our Sepia Saturday theme this week features an old photograph which looks down on the port of Tonsberg in Norway, and for some reason the mixture of land and sea, inlets and islands, reminded me of that part of England known as the Norfolk Broads. And therefore I turned to one of the old photograph albums kept by the inimitable Frank Fieldhouse ("Uncle Frank"). 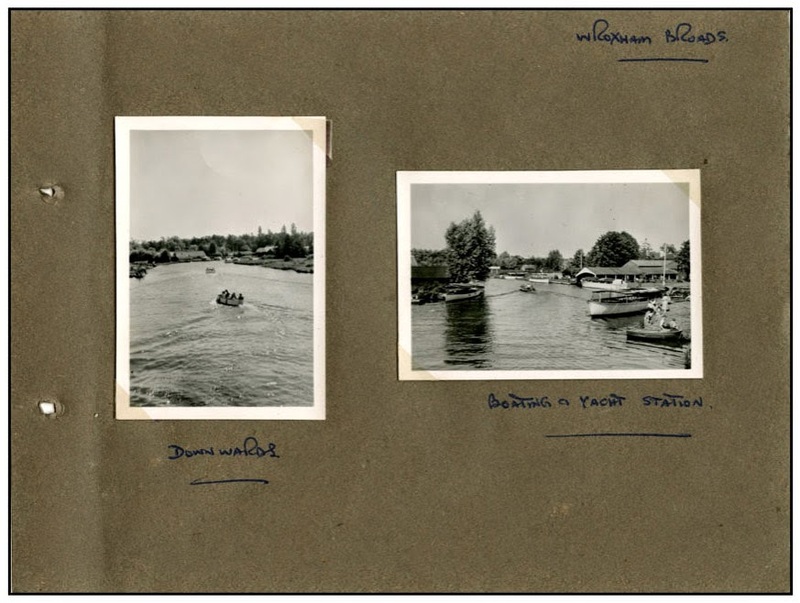 These snaps remind us where"
The page that particularly interested me was the one headed Wroxham Broads, which contains two photographs: "Downwards" (which just happens to be one of the suggested themes this week) and "Boating and Yacht Station". 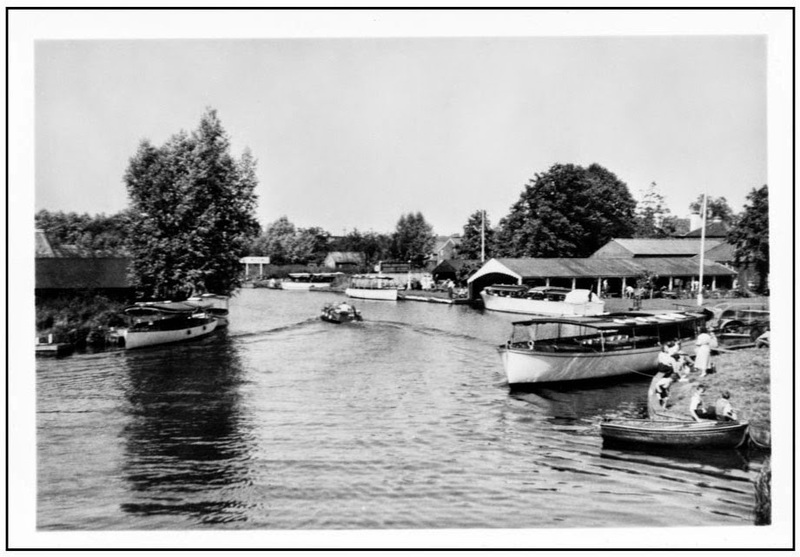 Wroxham is sometimes called "the capital of the broads", and, as far as I can tell, the scene depicted in the featured photograph has changed little over the last sixty five years. For reasons I am not quite sure of, I have never been to the Norfolk Broads although I seem to have set off on a journey there on a number of occasions and got waylaid by a country pub. One day, maybe, I will get to stand on Wroxham Bridge and look downwards. And if I decided to get in one of those little boats and sail down that broad to the open sea and then keep on going in a north-easterly direction, my next landfall would be ..... yes, you guessed it, Tonsberg in Norway. If you decide to undertake such a journey, you could occupy yourself during the long sea voyage by going over to the SEPIA SATURDAY BLOG and following all the various links. 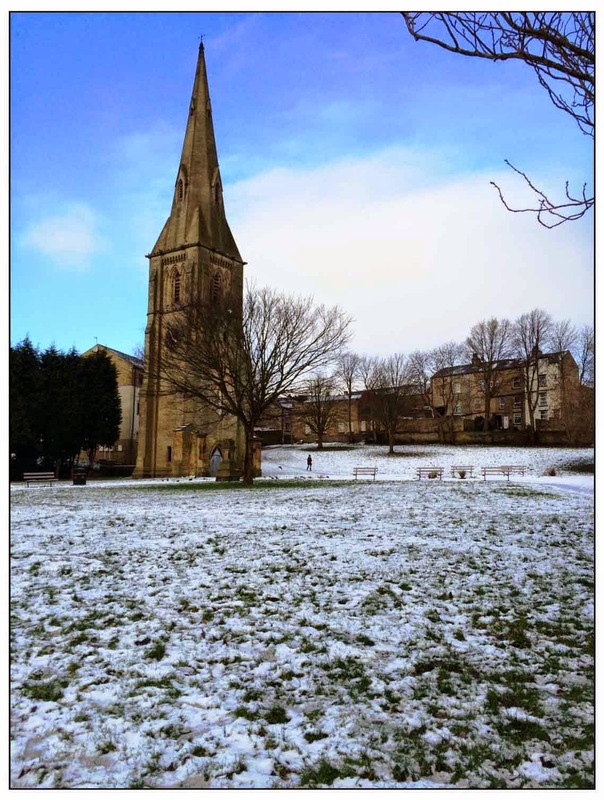 Went for a walk around Brighouse this morning in the winter sunshine. I eventually found the Brandy Snap Works (see A MISSION TO SNAP THE DESIGNER BRANDY) which looks everything a Brandy Snap works should look like. Just around the corner were the lemonade springs but sadly the cigarette trees have been uprooted. It's a wonderful place, Brighouse. 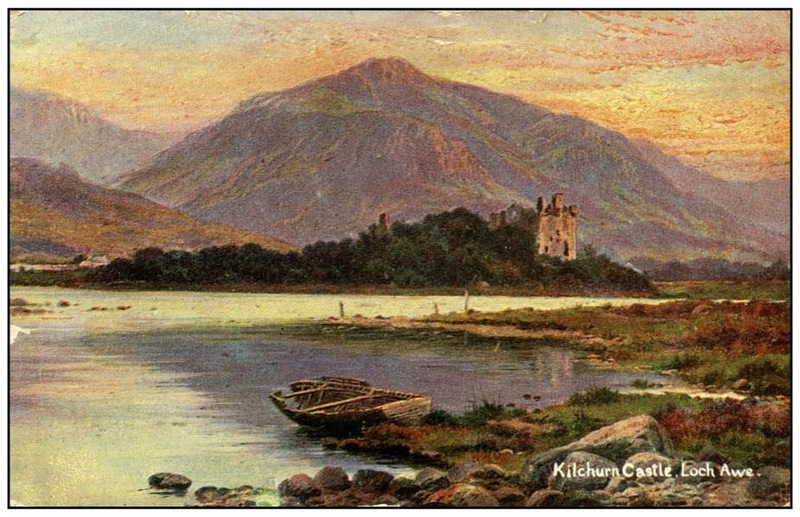 My third found dollop of history (50 pence from the second hand shop) features a 1909 vintage postcard of Kilchurn Castle in Scotland. Kilchurn Castle is a ruined structure which is either on the banks of Loch Awe in Scotland or on a small island in the middle of Loch Awe (depending whether it has been raining or not). When I saw the card I thought it might be vaguely familiar and I suspect I have seen it from the train when I have been travelling to Fort William on the wonderful West Highland Line. Part of it dates from 15th Century and part of it from the 17th Century, but both bits suffered badly when the castle was struck by lightening in 1760 and it has been abandoned ever since. 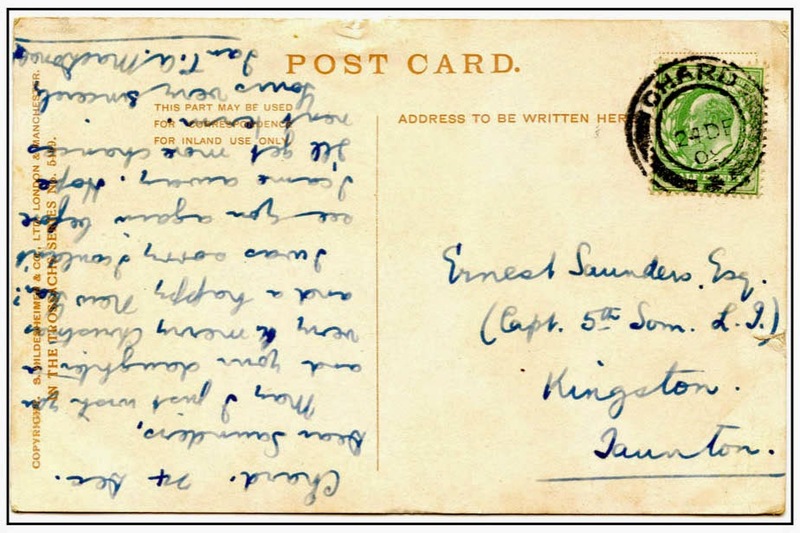 The card was sent to Ernest Saunders, who was a Captain in the 5th Somerset Light Infantry, and who lived at Kingston near Taunton. For some reason, the sender, Ian MacDonald, wrote the message upside down. To save you the bother of standing on your head, here is a transcription. Chard, 24 December. Dear Saunders, May I just wish you and your daughter a very merry Christmas and a happy New Year. I am sorry I couldn't see you again before I came away. Hope I'll get more chance next term. If Saunders has a daughter he can't be a pupil and, if MacDonald calls him "Saunders", neither can he. Thus, we can probably conclude that they were both teachers. 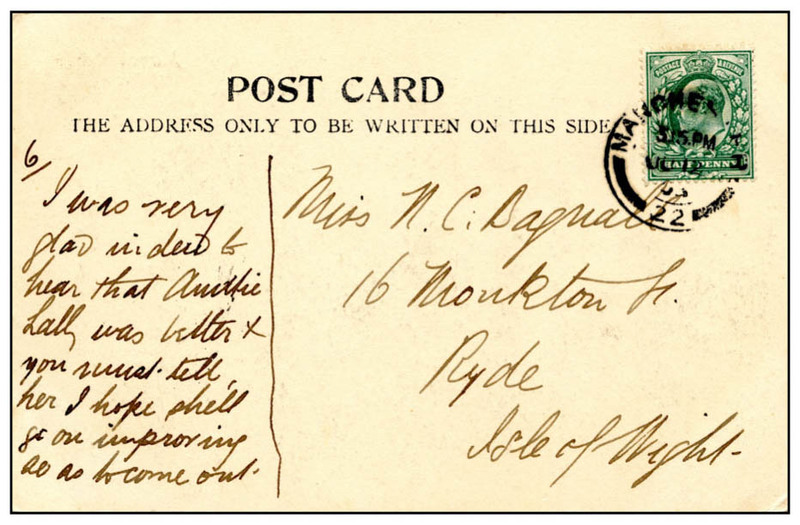 The card was sent from Chard in Somerset, but I can't find any notable schools there, so we can probably assume that both men had travelled home for the Christmas holidays. 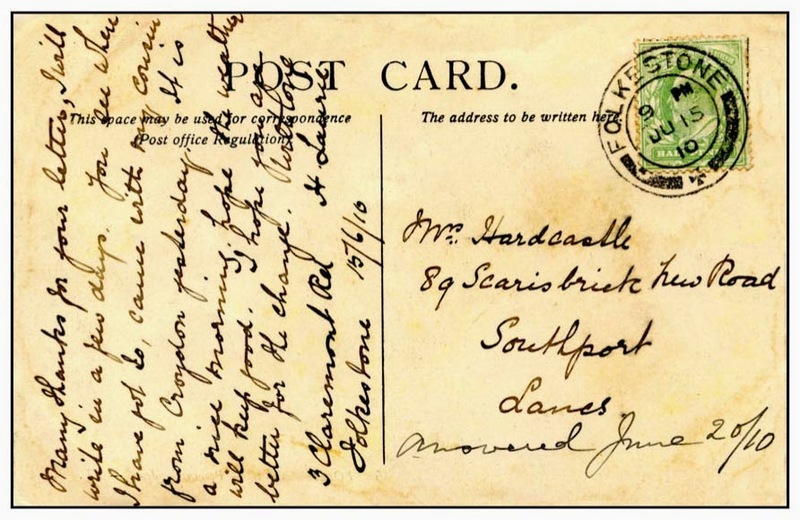 Who knows when MacDonald acquired the postcard. But a postcard of a ruined castle that belonged to the Campbell Clan will always be an attractive prospect to any MacDonald worth his salt. I took delivery of a ridiculously cheap tablet today, it cost under £40 and is just the kind of thing to keep in your pocket and not worry about it getting scratched or knocked. At the same time it can handle my mail, host my Evernote account, access my Kindle library and do most of things that my iPad - which cost me more than 15 times as much - can do. I even discovered that it can even take photographs (of a type) although it is more pin-hole quality than HD. It will join a phalanx of other gadgets I take and access images with. I took this photograph on my mobile phone last night. 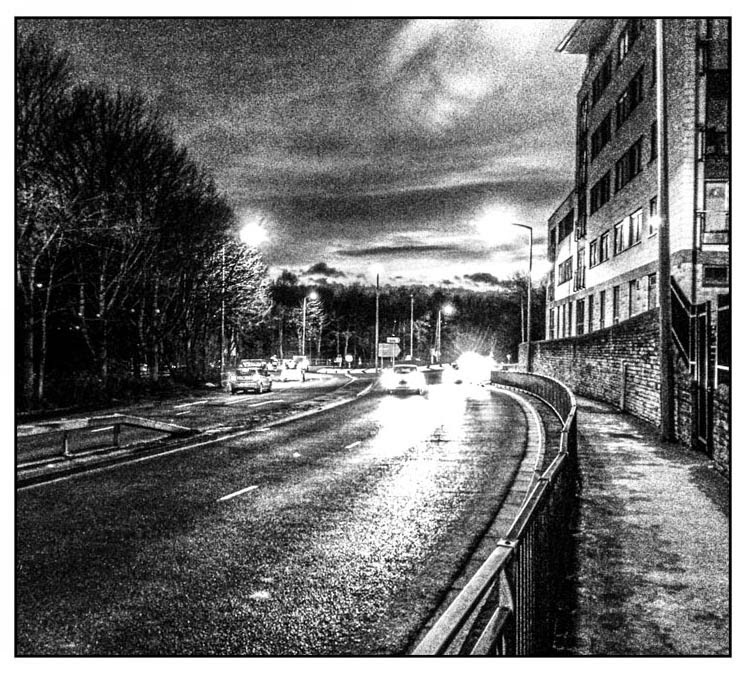 A night shot taken on Brighouse Ring Road. This is a photograph taken over thirty years ago at Orgreave near Sheffield (the site a few months later of the infamous Battle of Orgreave) using one of those old fashioned cameras that used film. This is a recent scan from my negative archives. 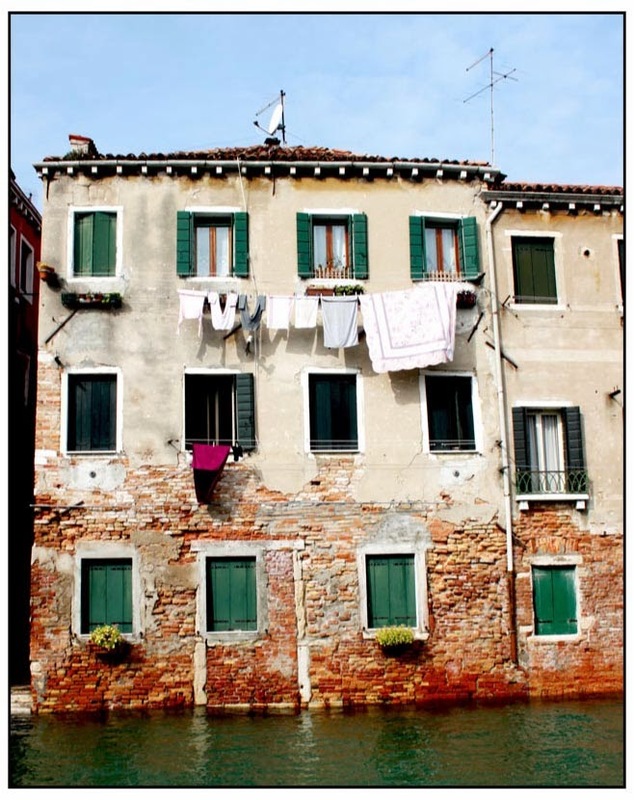 And this final example is a picture taken in Venice in October, using one of the latest Digital SLR cameras. At the end of the day, it doesn't matter how you take them : photographs are a lasting pleasure. 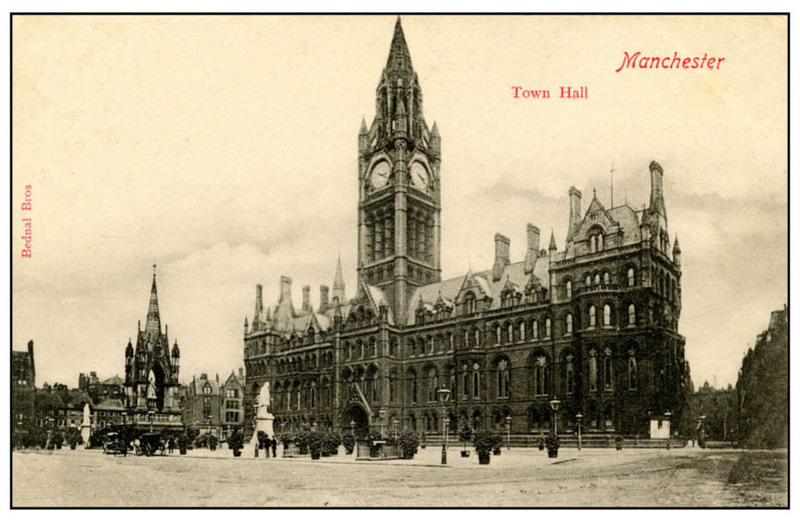 The card was posted in Manchester and the illustration shows the truly magnificent Manchester Town Hall. Built in the 1870s in Victorian gothic revival style and designed by Alfred Waterhouse (who also designed another of my favourite building, the Natural History Museum in London), the town hall is still a wonderful sight in Manchester. The monument that can be seen in front of the Town Hall is the Albert Memorial, one of hundreds of such memorials that were constructed in a wave of Victorian patriotic grovelling following the death of the Prince Regent. Last time that I was in Manchester, that wide open square in front of the town hall was full of wooden stalls selling all many of products, part of the annual German market. Auntie Sally might have enjoyed it, but Prince Albert and his wife would probably not have been amused. What a strange world we live in where consumer purchases are driven by designer labels (and as an owner of an iMac, an iPad, and an iEverything-else, I should know). What odd behaviour it is to buy a product due to the packaging rather than the content. I am, however, a proud citizen of such a strange world and as such I happened to come across a bag of Wright's Famous Brandy Snap yesterday. I slipped it in my shopping trolley and when I received one of those looks from the GLW - the kind that compress the eloquent phrase "I thought you were supposed to be starting a diet you greedy pig" into the briefest of glances - I replied "I just want to scan the bag". The wonderfully crumpled printed paper bag, complete with twisted corners, was the nearest I have seen to a work of art since I last visited the Yorkshire Sculpture Park. 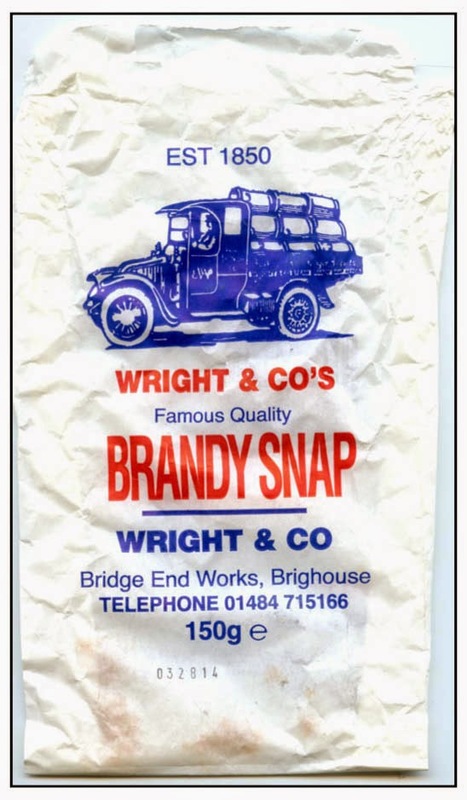 I was vaguely aware that Brighouse was the home to a brandy snap works, but I have never managed to track it down. But now I have a mission in life, a vocation, a purpose to my endlessly dreary days. I am going to find that brandy snap factory and ..... snap it. 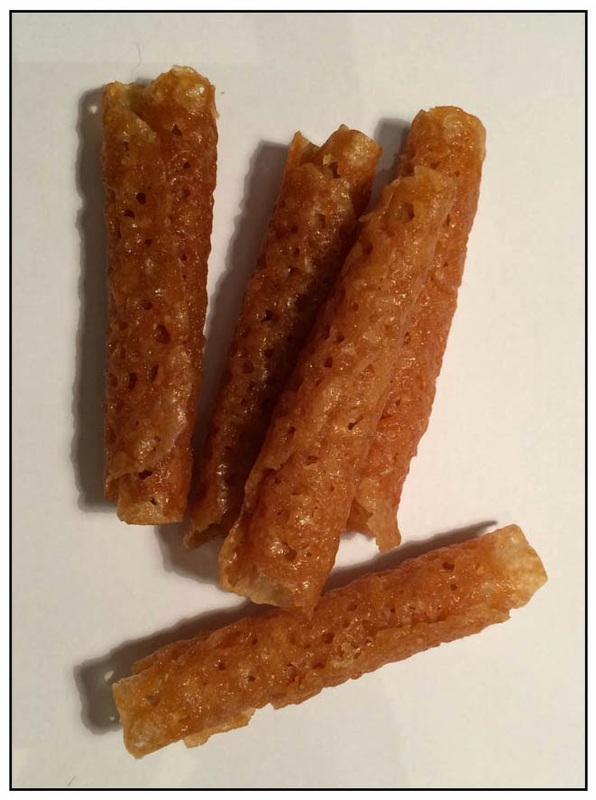 Like all good designer products, Wright's Quality Brandy Snaps has its own Facebook page and, like all devoted acolytes, I have "liked it". I a proud to say that I am part of a small but select group of just 26. Realising that some of the readers of this blog from further afield might not know what brandy snap was (I occasionally get visitors from Lancashire, but I don't encourage them), I decided to take a photograph of the contents of the bag. Sadly, there were far too many individual brandy snaps to make a pleasing composition, so consequently I had to eat a good few in order to achieve this delicious photograph. The lengths I will go to for my art. As I said, delicious. Called in at the local antique centre this morning and bought myself a dozen vintage postcards for £10. The spirit of my father probably hovered over me as I handed the £10 note over, muttering "thas bin robbed, thas more money than sense", but the purchase gave me pleasure and it will keep me quiet for a day or two. As far as I am concerned, what I bought was a dozen dollops of history. Over the next week or so I will share them with you. 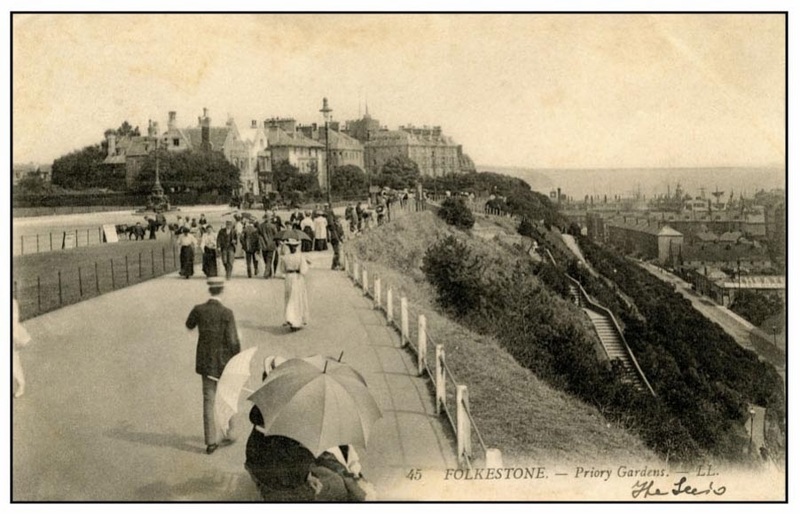 A lovely old picture card which features Priory Gardens in Folkestone which is on the south coast of England (these days, one end of the Channel Tunnel is close to the town). The writing on the front of the card is, I think, "The Leas" which is the name of the steep cliff which overlooks the old town. It was here that Folkestone Priory stood (now long, long gone) and it was here that a couple of fine hotels were built at the end of the nineteenth century. I think it is these that you can see in the centre distance on the card. The grandest of the two was rightly named "The Grand" and it was a popular spot for King Edward VII to meet his "friend" Alice Keppell. In 1909, a year before my card was sent, the King officially opened the new ballroom at the Grand, the first sprung dance floor in Europe. He took the first dance on the floor - and his partner was Mrs Keppell. Our theme for Sepia Saturday 263 features an old advertisement for air cushion pads for horse's hooves. That odd chap who sets these themes suggests that we might like to go for old adverts or strange and unnecessary products. My first offering is an old advert dating back to May 1944. 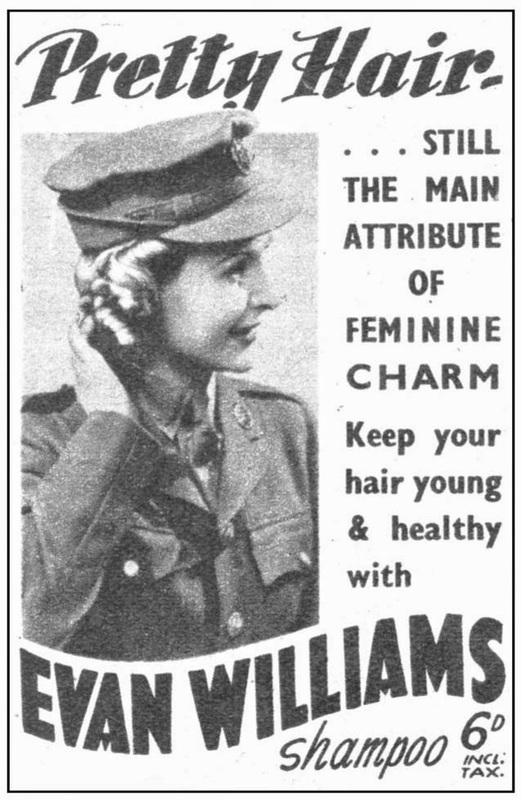 It tells us that even in the midst of armed conflict - World War II was at its height - "pretty hair (was) still the main attribute of feminine charm". In order to achieve that feminine charm what you needed was a sachet of Evan Williams shampoo. "I remember that we always used Evan Williams shampoo which came in a paper sachet and which we mixed with water in a jam jar. If there was any left over, it set like a lobby jelly which slithered through your fingers"
Another advert from the same magazine illustrates a product which might be considered to be more on the cushioned pads for horses end of the pointless scale - cosmetic surgery. The Hystogen Institute in Old Quebec Street, London was established in 1911 by Charles Henry Willi who had been born in Switzerland in the 1880s. For the next fifty years he ran one of the most successful cosmetic surgery clinics in England and when he eventually retired in 1961 he had accumulated a substantial fortune and moved to live in the fashionable French Riviera. What is perhaps remarkable - not to say bone-shakingly terrifying - about Willi is that he appears to have had no medical training at all. The various qualifications he claimed in his literature were either fictitious or purchased from fake degree factories. It has been suggested that he learnt his trade by practicing on pigs' heads; a fact that did not feature prominently in his advertising literature. 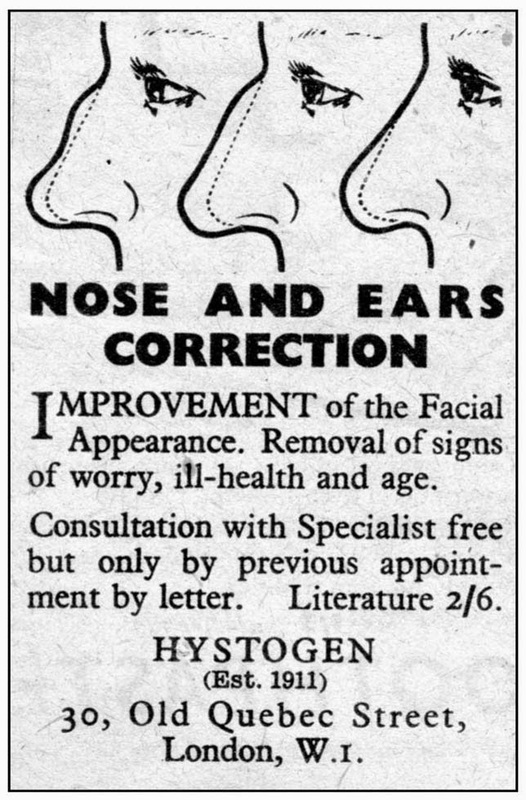 Both these adverts are taken from a copy of Picture Post dating back to the 6th May 1944, which I bought for a few pence at a Antique Fair a couple of years ago. 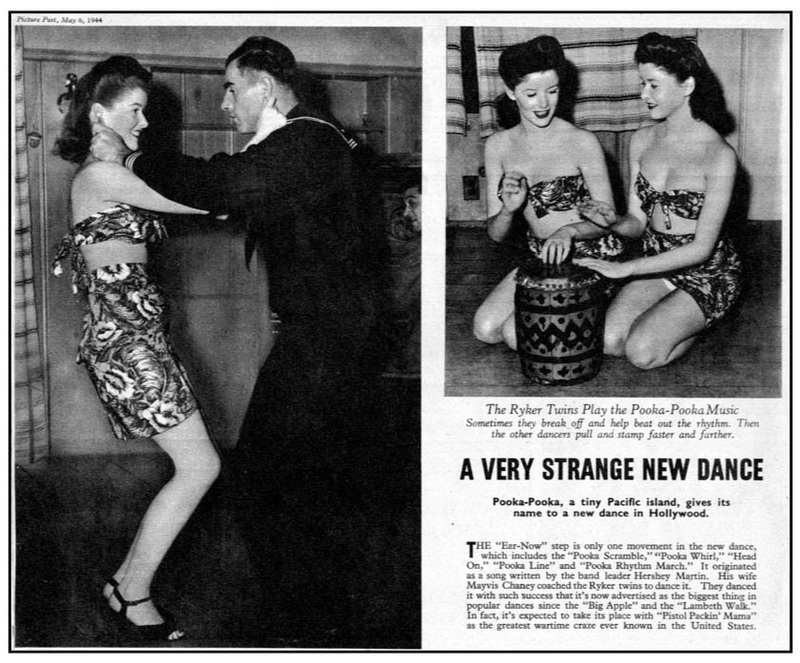 In addition to such glorious adverts, the magazine in full of excellent photography and fascinating articles on subjects such as the new dance that was sweeping the nation back then - the pooka-pooka! Like pretty hair and a perfect nose, the pooka-pooka managed to pass me by - but I am going to do a search on Amazon to see if I can find some air cushioned rubber paw pads for Amy. Sepia Saturday - the finest product that money can't buy. Available free of charge on the Sepia Saturday Blog. 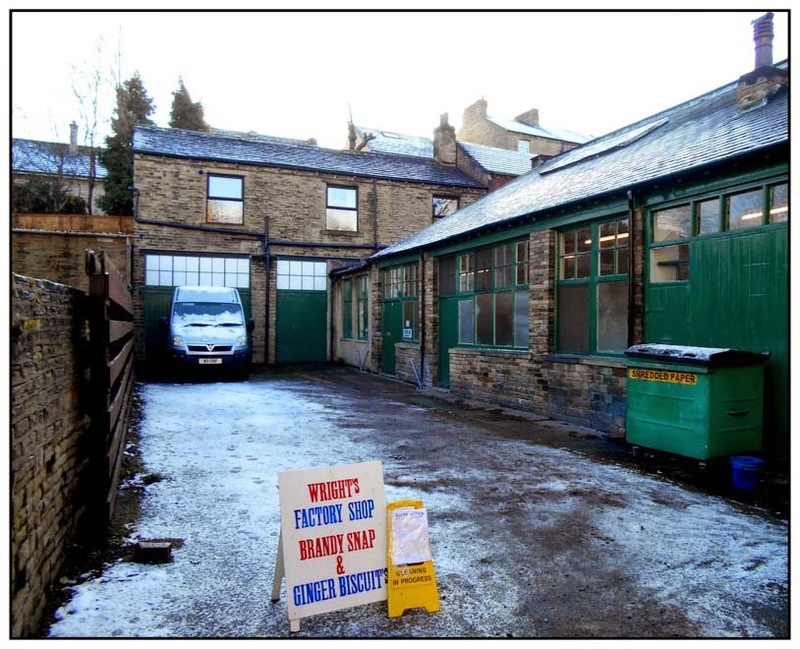 There is still a fair amount of snow and ice around, so this morning we gave a lift to a friend who needed to visit the doctor's surgery in King Cross, Halifax. Whilst waiting for them I managed a quick walk up King Cross Road, a part of Halifax I have not visited for years and years. When I was at school, fifty years ago, I would travel through this part of town two or three times a day. Everything seemed so much bigger back then; bigger and brighter and more prosperous. It wasn't, of course, it was nothing more than the effects of viewing things through the milk-bottle lenses of history. 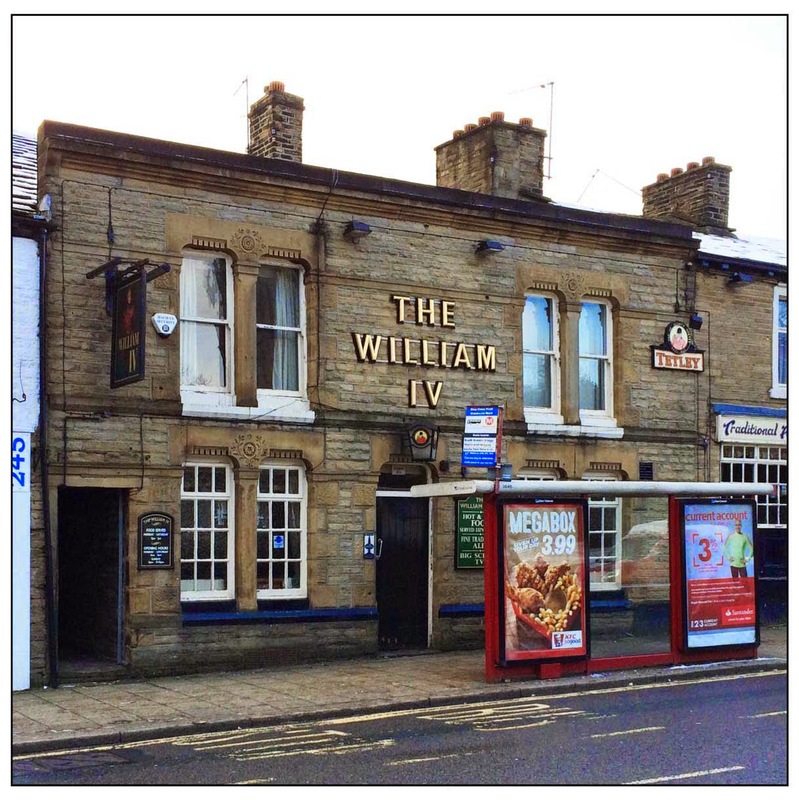 I would often get off the bus at the William IV and take a short-cut through one of the alleyways that have long since seized up with the passage of time. I am not sure when the pub was built - as far as I can see nobody has yet written a decent history of the place. Perhaps I should take the task on, I have always been of the belief that local history permeates the very fabric of a pub like old beer staining trestle tables. Whenever it was built, they knew how to build pubs back then. Look at that finely cut and carved stone: no corners have been cut, no expense have been spared. 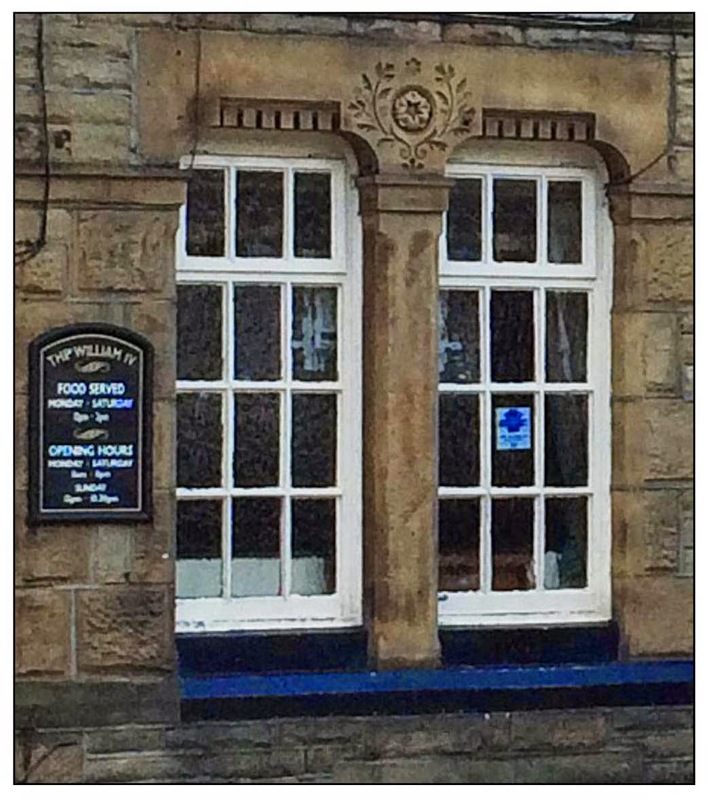 And all this care was for a common beerhouse (a legal description rather than a value judgement), not a pompous town hall nor a boastful bank. Just across the road from the pub stands what remains of the old St Paul's Church which was built in 1847 with funds supplied by the publicly-funded Church Building Commission. A new St Paul's was later built further down the road as the 1847 building had run out of space during those pious decades of the nineteenth century. The building eventually fell victim to a fire in 1930 and everything but the tower and spire was demolished a year later. The spire still stands and the golden stone provided a warm boundary between the icy earth and the frosted sky. 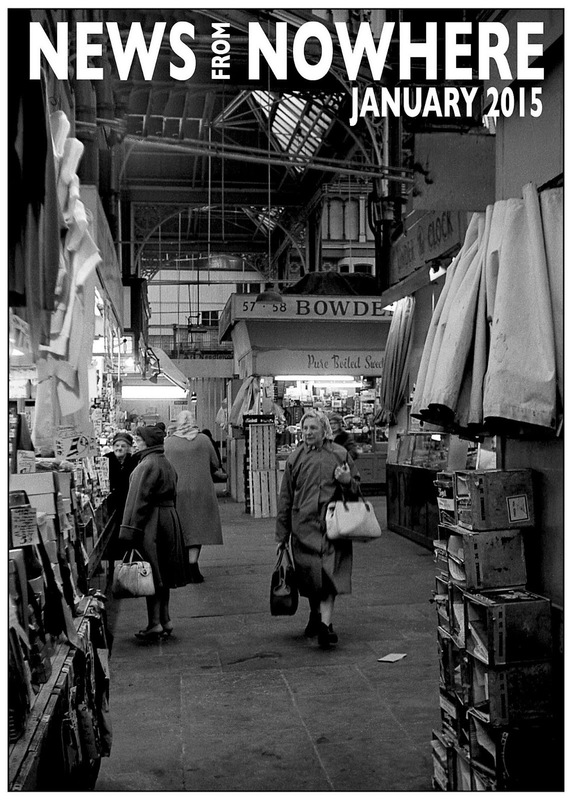 Our Sepia Saturday image this week offers a couple of potential themes: the law and writing on photographs. I am hoping to match both with this photograph - and as a January bonus - include our old friend, Auntie Miriam. The photograph was taken by Uncle Frank and this means that it is richly catalogued. Uncle F would have loved computers if he had lived to experience the digital age. But at a time when Alan Turing was puzzling how to apply his wartime logic machines to solve peacetime problems, Uncle F was limited to card, crayons and snapshot albums. 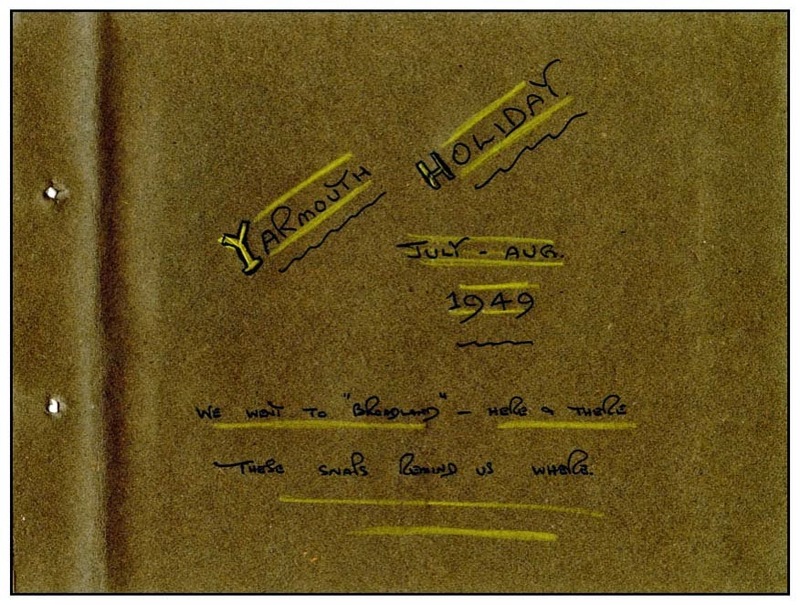 The album in question is entitled "Great Yarmouth and Norfolk Tour, July and August 1950" (Memo to Uncle F : we would call that a folder name these days). The photograph appears in a section of the album entitled "Sandringham" and Sandringham is famously the location of the country estate of the British Royal Family. A complete scan of the two pages of the album reveals the writing; not on the photograph itself but on the album pages. The written note on the left hand page says "We did not see the King but we did see the Princess Margaret". 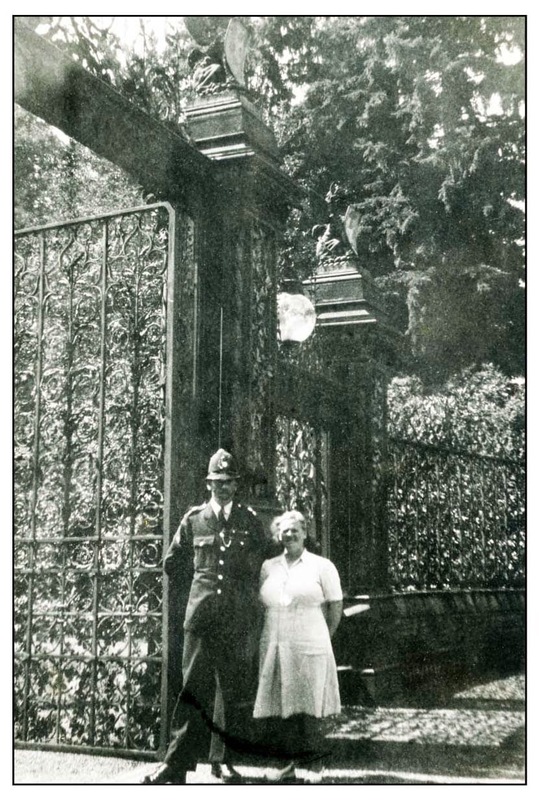 Next to the specific photograph is written, "Yes - their majesties were in". Their majesties were King George VI and Queen Elizabeth, but by this time King George was not a well man - he would die about eighteen months after Auntie Miriam's visit - and was spending more and more time at Sandringham. Thus we have plenty of writing, so that is one theme box which can be ticked, And as far as the law is concerned we have the policeman and we have the fact that, in British law, justice is carried out in the name of the monarchy. If Auntie Miriam had, in an outbreak of mischievousness, knocked off the policeman's helmet, she may well have been charged and sent to court and the case forever more would have been known as Rex v Fieldhouse. Thus ends the case for the prosecution. To review the other evidence in this week's case go to the Sepia Saturday Blog and follow the links. Back in 1967, Prime Minister Harold Wilson attempted to explain the impact of the devaluation of sterling by saying that it would not affect "the pound in your pocket, in your purse or in your bank" and there was an element of truth in the assertion. There is a degree of separation between high economic policy and the crumpled banknote in your purse; but it is only a small degree: banknotes can relate great historical sagas just as effectively as any dry history book. Tidying my room the other day, I came across a little piece of coloured paper I had acquired a good few years ago. 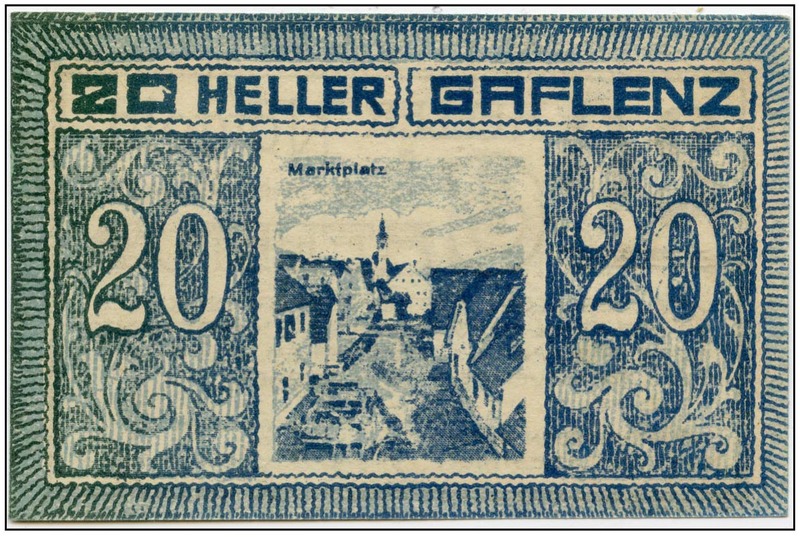 It is a small Austrian banknote dating from November 1920, a banknote for the sum of 20 Heller. Even ninety-odd years ago this was no princely sum - just a few pence: and given the decades of revaluation, devaluation and currency change that has taken place since it was printed it is now virtually worthless. Worthless, that is, in an economic sense: but as a thing of some beauty and as a bookmark to history, it is as valuable now as it was the day it was printed. The note belongs to that category of emergency banknotes issued during the early part of the twentieth century, particularly in Germany and Austria, which are known as Notgeld. They were issued at a time when economies were collapsing and inflation was rampant. Central Banks were fighting a losing battle to keep up with price increases by printing notes of larger and larger denominations and coin production quickly became a pointless exercise. 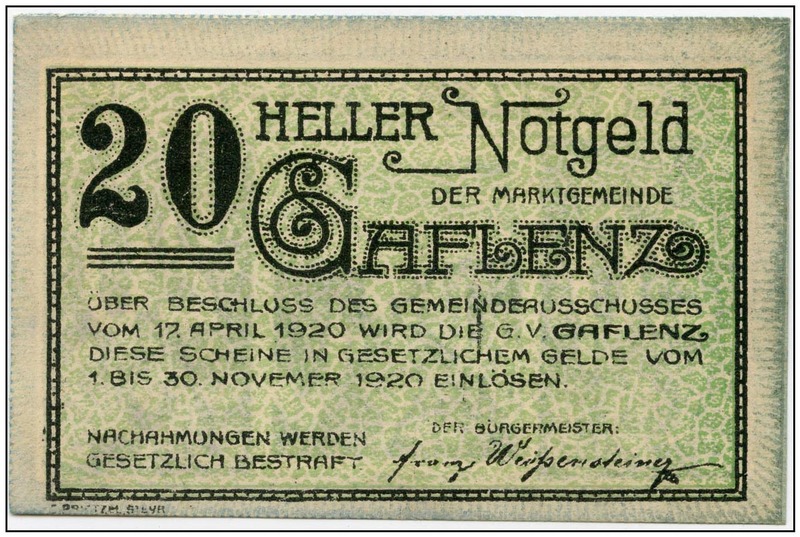 Local communities began to issue their own notes - Notgeld - for small denominations in order to stimulate local trade and keep up with the endless rounds of price increases. My little piece of coloured paper was produced by the small Austrian town of Gaflenz. Today it is a prosperous little market town and tourist centre. As the citizens of the town settle down to their coffee and Wiener Apfelstrudel they might read of the European Central Banks' warnings of the dangers of deflation. But as they do so, they may reach into their purses and pockets and find that little piece of coloured paper passed on to them by their grandparents and conclude that there is a lot to be said in favour of a stable currency. This picture postcard of the Labour politician John Hodge dates from 1906, the year Hodge was finally successfull in his quest to become a Member of Parliament. He was 51 years old when he was elected as the MP for Manchester Gorton in the General Election which saw 29 members of the new Labour Party being returned to Parliament. 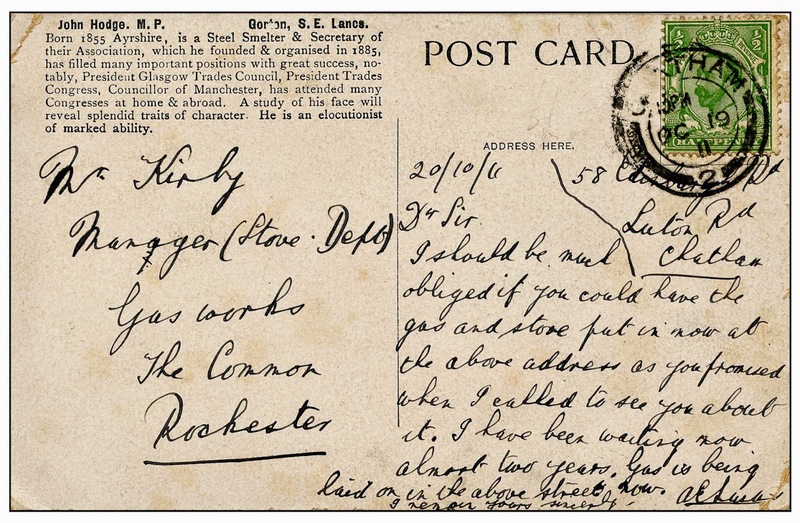 It was a time when politicians could match music hall stars as the postcard celebrities of their day, a time of change when the working class were beginning to understand the potential political and economic power that lay within their hands. Like so many of the other Labour leaders of the time, Hodges background was in the trade union movement. Born in Ayrshire, Scotland he had worked as a puddler (an intensely physical job that involved stirring great vats of molten ore) in the local iron works. 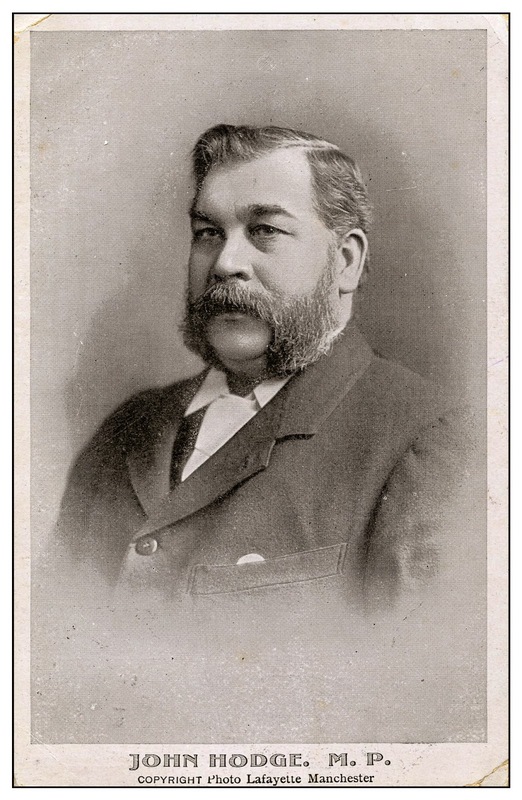 He became one of the founder members of the British Steel Smelters’ Association - a union he later became the General Secretary of - and he went on to hold high office in the British trade union movement including President of the Trade Union Congress in 1892. The outbreak of the Great War brought deep divisions to the British Labour Party which was made up of elements that were pacifist and internationalist and other elements that were fiercely patriotic. Hodge was firmly of the latter persuasion and soon was claiming that all strikes during wartime were not only unpatriotic but indeed were acts of treason. He became a leader of The British Workers’ League, a movement that started as patriotic and increasingly became anti-socialist and right-wing. In 1916, Hodge - who was still a sitting Labour MP - was invited to become a member of the wartime coalition government of David Lloyd George and became the very first Minister of Labour, and a year later he became Minister of Pensions, a role he kept until the coalition collapsed in 1919. He remained an MP until 1923 and remained a trade union leader until 1931. He retained his right-wing, anti-strike beliefs throughout this period and strongly opposed the General Strike in 1926. He died in 1937. Arthur Griffith-Boscawen, a Tory Cabinet Minister who had worked with Hodge during the First War described him in what he no doubt saw as a complimentary way as: “a fat, rampaging and most patriotic Tory working man”. Dear Sir, I should be much obliged if you could have the gas and stove put in now at the above address as you promised when I called to see you about it. I have been waiting now almost two years. Gas is being laid on in the above street now. I remain, yours sincerely, A E Lucas. As someone who has spend a significant proportion of his life waiting for the gasman to come, I have every sympathy with Mr Lucas. One can’t help wondering whether it was an iron stove made by Mr Hodge or one of his members. If so, John Hodge would certainly have approved. Or perhaps it was late because the gas workers had been on strike. If so, John Hodge would certainly have disapproved. 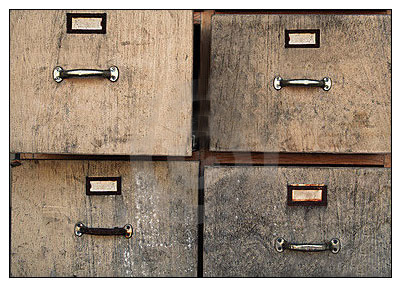 "I have always been a keeper, a sorter, a filer, an archiver. It's a personality type characterised by the desire to put things in boxes, stick labels on the boxes, and stack the boxes in some kind of order. Sometimes it's a blessing (I am always the one asked to help find things) and sometimes it's a curse (I am always the one asked to help find things). Throughout my life the filing medium may have changed, but the message has always been the same : "clip it, tag it, and save it". 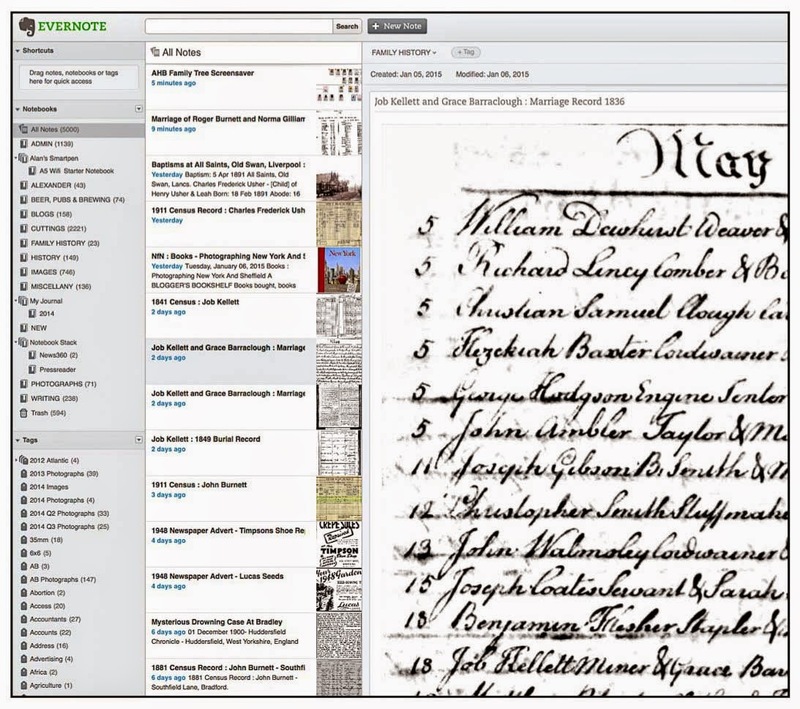 At one stage it was things cut out and stuck onto filing cards, and then when computers came onto the scene, it would be complex databases of trivial information. My music collection has been catalogued more times that a Mozart symphony, my negatives have been archived with a care that would be more in place in the Library of Congress". I wrote that back in September 2012 when I was celebrating the 1,000th addition to my Evernote database. I return to it two and a half years later as I celebrate my 5,000th addition. In that time, Evernote has become an integral part of my life providing a home to everything from my musings on the meaning of life to my latest gas bill. To all intents and purposes, my life now exists on the cloud. And as I approach old age, I see this as part of a continuing process: a migration from earth-based life to cloud storage which will provide me with an element of everlasting life. The next phase will be to scan my body parts, as they become either redundant or defective, for storage on my Evernote cloud-based database. I have made a start with the little finger of my right hand which - for some time now - has been less than useless due to Dupuytren's Contracture. 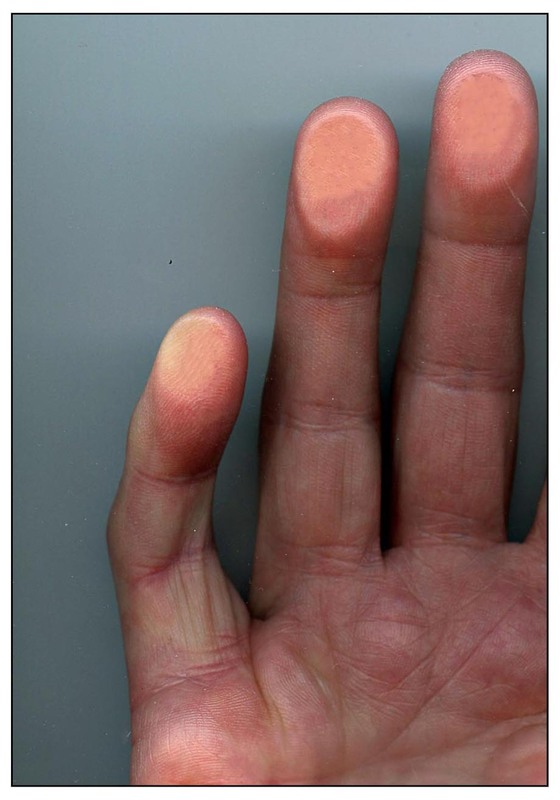 You will notice that I have scanned a couple of other fingers for the sake of context - this might be useful if anyone attempts to reconstruct me - like an IKEA wardrobe - from the isolated stored parts at some time in the future. All this is for the future. When my Evernote database reaches its' 10,000th record I will report back on progress. This listing of books is not intended to be a set of serious reviews but rather a list of books I have bought, books I am reading, and books I have read. This particular volume falls into the first category and inhabits that hefty pile entitled “Books To Read”. 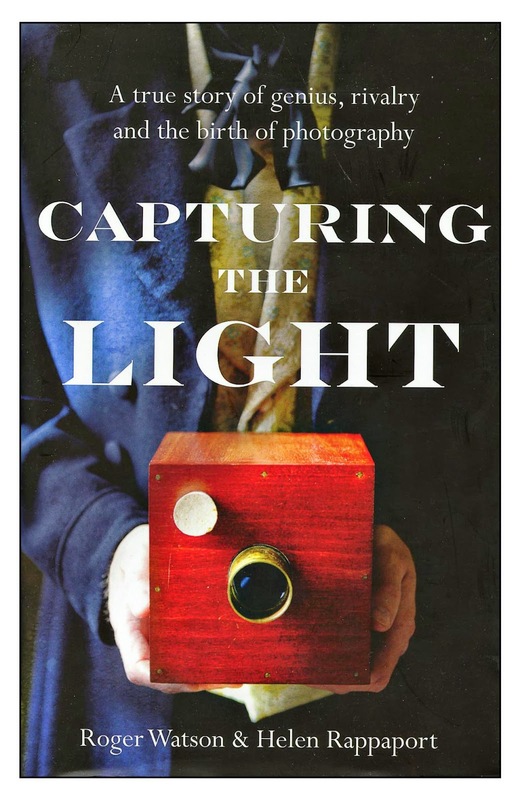 I bought it for two reasons: first it traces the development of photography by telling the stories of the two great pioneers of the medium - Louis Daguerre and Henry Fox Talbot. Secondly, it was on sale in a remainders shop and reduced by 80% in price. I am always a sucker for such shops and walk around them buying up orphaned books with all the enthusiasm of a Doctor Bernardo. The contrast between the two central characters of the book is expertly summed up by a couple of quotations at the very beginning of the book. Looking back on their respective discoveries which introduced photography to the world, Fox Talbot talks, almost scientifically, about how he hopes he has helped to create a foundation from which more skilful hands than his will rear a superstructure. Daguerre simple states, “I have captured the light and arrested its flight!. The sun itself will draw my pictures”. Like many others, I have a couple of January rituals. The first is starting a new diary, the second, which follows with depressing predictability, is abandoning my new diary. If any poor fool is landed with the task of writing my biography, the source material will inevitably lead them to the conclusion that I am infused with activity during the first work or two of January and then sink into an hibernator state for the rest of the year. Despite my atrocious track record, I still invest a considerable amount of time and effort into choosing which particular diary I will abandon in the coming year/month/week or even days. This year I have taken a new approach, abandoning traditional diaries for this magnificent picture book. 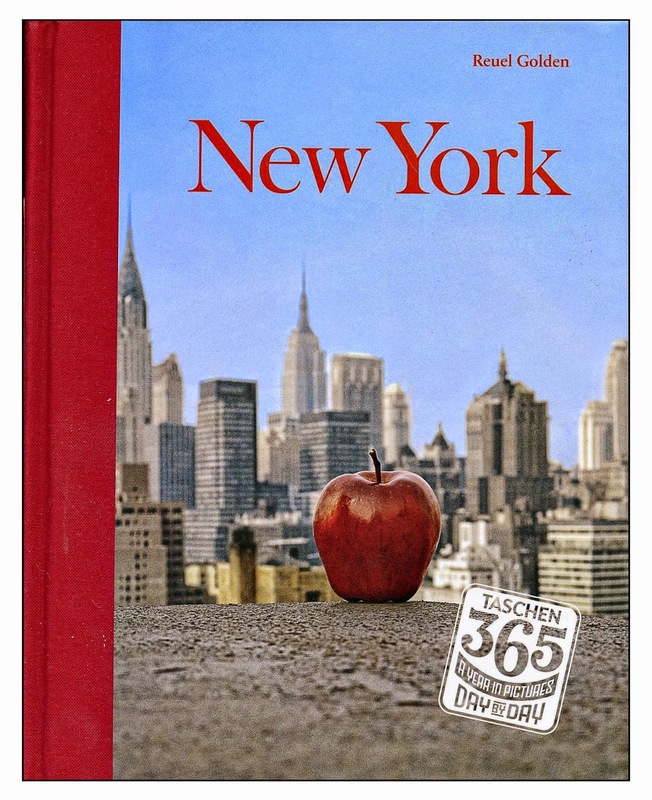 Each day has a generous two page spread which is largely given over to a beautifully reproduced archive photograph of New York. There is sufficient blank space to be able to add your life story - “got up, went to the shop, went to the pub …” - but the danger is that the book is so attractive in its pristine state that you might just be tempted to leave it unmolested. As I have aged I have fallen more in love with the image, quite possibly at the expense of my affection for the word. You need to be careful with words, they can lie and mislead. But images are the original WYSWYG (What You See Is What You Get). I need to read books of words, whereas I can graze on picture books; and like some elderly ruminating goat I can often be found flicking through the pages of a picture book. 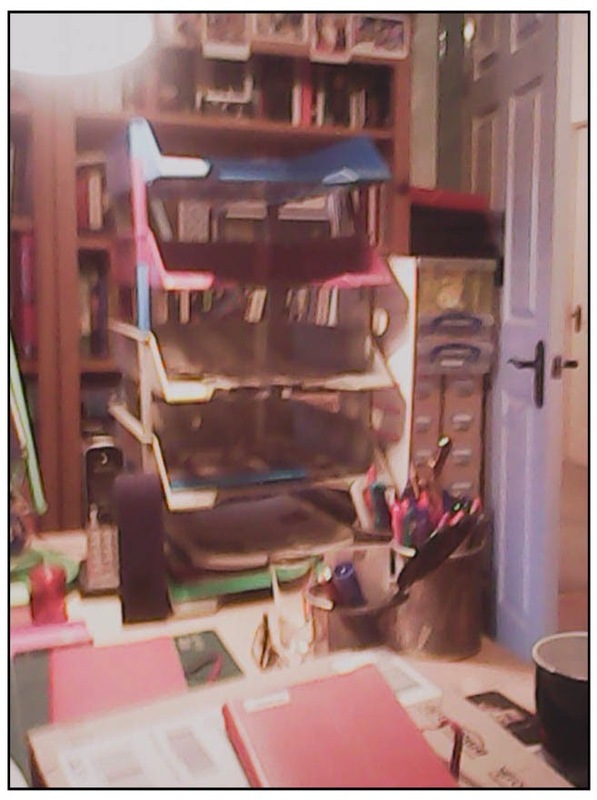 Think of it as a kind of second childhood, a reversion to the nursery. 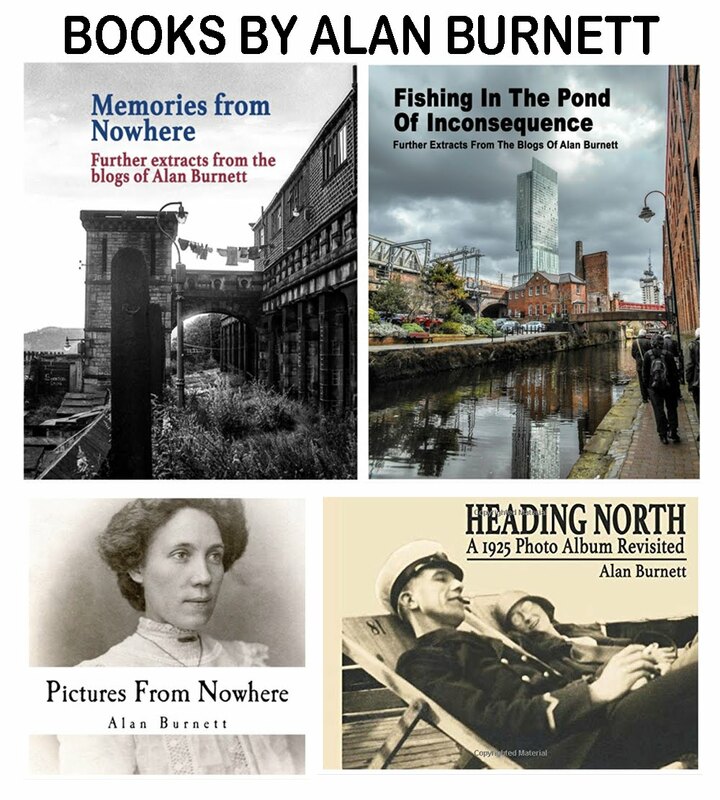 This time my fare tends to be collections of archive images rather than illustrated stories about alliterative creatures - but the principle is the same, as is the enjoyment. 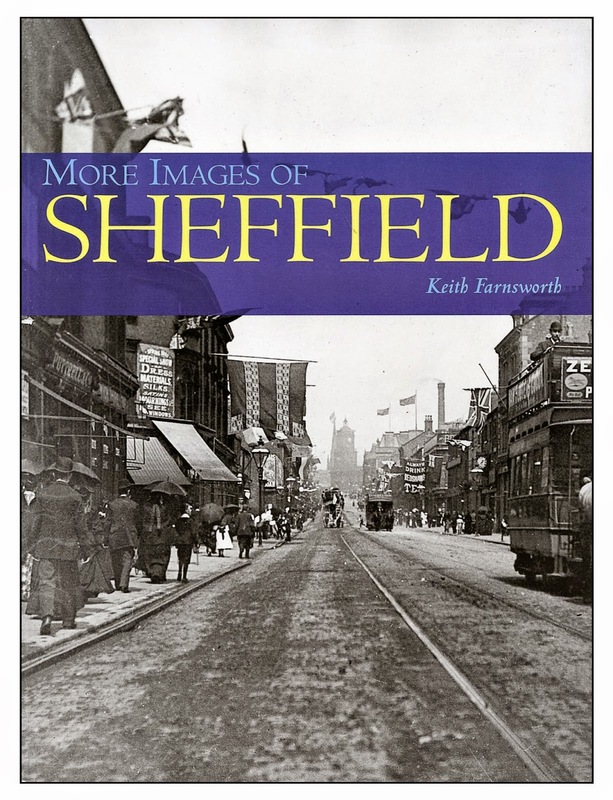 I spent twelve years of my life living in Sheffield and it is a city that I will always have a large degree of fondness for. It is a city with few pretensions, a city built of steel plates soldered together with the flux of honest hard work. 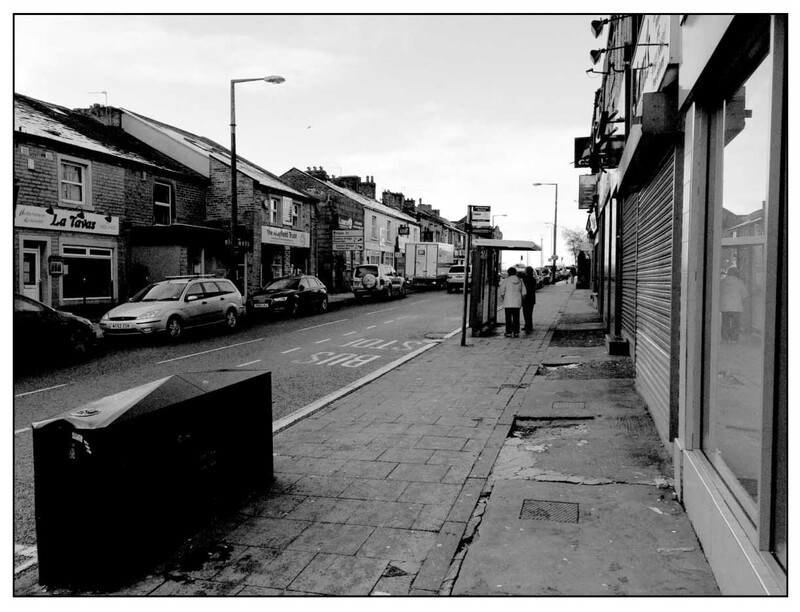 The pictures in this book are testament to this : there are few people pictured standing still and few buildings which don’t have an economic raison d’être. The pictures are monochrome, and they need to be. But sometimes life is a bit like that. Our Sepia Saturday theme image this week features some tents, a banner and some young people and it was chosen at random from the Flickr Commons stream of the Huron County Museum and Historic Gaol. And, for once, I have a pretty perfect match for the theme. It was the summer of '67. The Beatles All You Need Is Love had just been released and I recall that, as I took the above photograph, it was playing on some hidden transistor radio. 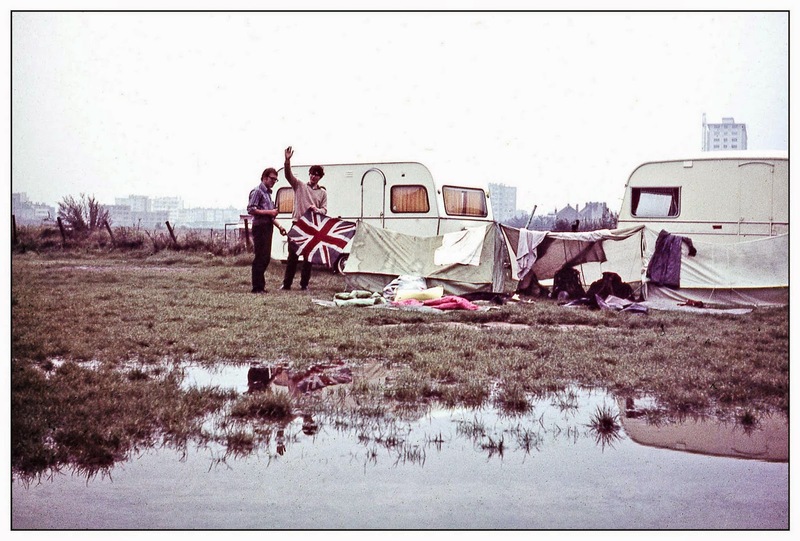 The camping site was somewhere near Amsterdam and the two people holding the banner were Darryl Oldfield and David Hebblethwaite. The third member of the party - the one taking the photograph - was me. 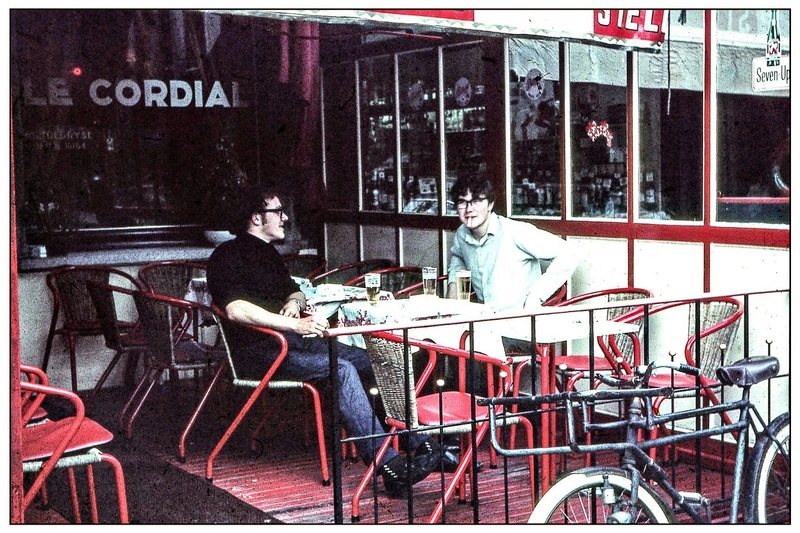 We had set off to hitchhike across Europe because that was the kind of thing you did in 1967. 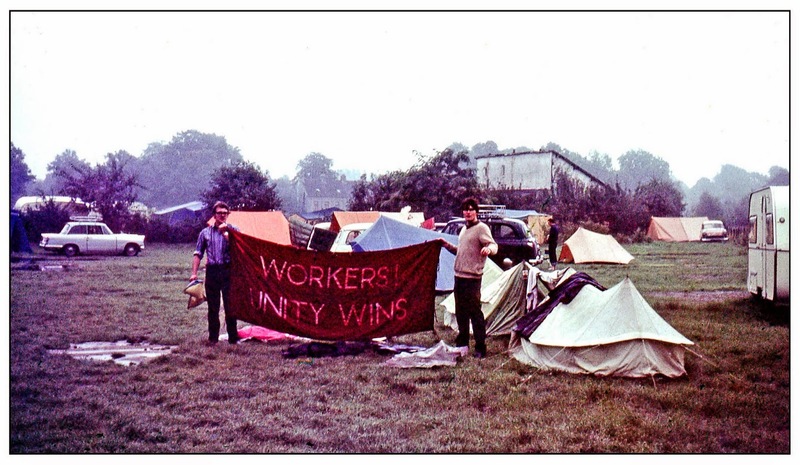 We carried the banner because we were three Young Socialists from West Yorkshire, all certain that some kind of revolution was just around some corner. And we had been tipped off that it might just be happening in the coffee houses of Amsterdam. We put tents in backpacks, rolled up our precious banner and set off in search of a new dawn - via the Dover ferry to Calais. The chances of three people managing to hitch a lift together were slim, so we would split up with merely the vaguest plans to rendezvous. One time in France I remember a discussion as to whether Belgium was a monarchy. This was not some political discourse, but a matter of practical arrangements. We came to the conclusion that there was still a Belgian King. "OK", someone said, "let's meet in front of the Royal Palace at noon the day after tomorrow". And so we hitched from city to city, from country to country; living cheap and living well. Some of the memories have faded with time, but when the precise detail is gone you are left with impressions and those are all that the impressions of youth should be. With all the things we carried, there was little room for cynicism. We didn't find the new dawn of course, although the world at the time was undergoing profound changes for the better. A few weeks later we returned home - via an overnight ferry to Immingham this time - and went our separate ways to College and University. I don't think I have seen Darryl and David in more than forty years, we have all lost touch with each other. But maybe, just maybe, they might be Googling their names and get a link to this post. If they do, let's meet up : how about the day after tomorrow outside the Royal Palace in Brussels? To see the other Sepia Saturday posts go to the Sepia Saturday Blog and follow the links. It was all going to be logical, so structured, so planned. 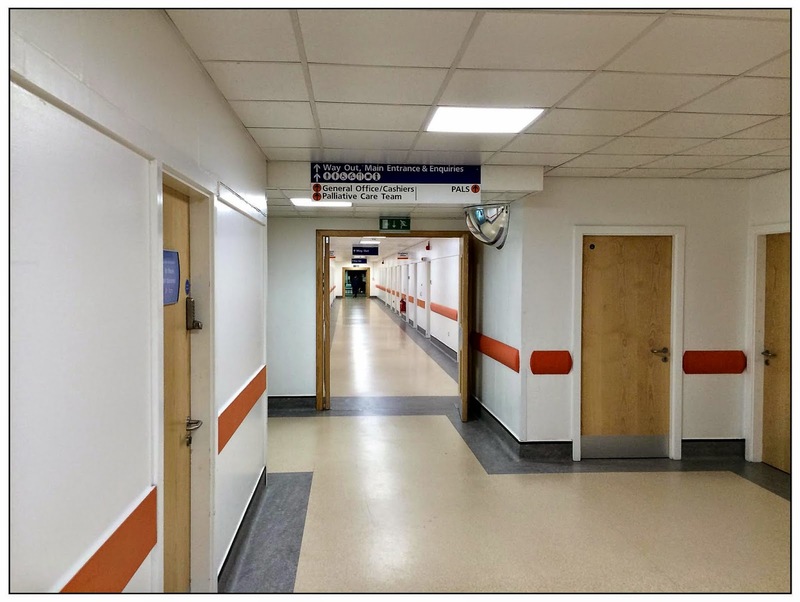 A new year, a new structured and planned blog complete with monthly collections of material from News From Nowhere and Alan Burnett's Picture Post, plus added bits for extra flavour. It was just a matter of getting Christmas over and then applying the logic to the structure. And then .... Isobel was taken back into hospital on Monday and my structure crumbled in front of my eyes and my logic dissolved like an apothecary's tincture. This is no time to be planning blogs. But it is a time to remain positive. It looks as though the problems - which were a known complication of the major surgery she had last September - may be in the process of resolving themselves without the need of new surgical interventions. However, for the first time in 48 years I spent New Years' Eve apart from Isobel, and the last few days have been an endless procession of hospital visits and anxious phone calls. Perhaps I can put one of my new plans into action. My diary this year will be a series of daily images - a far better aide-memoire than any collection of words. I won't bore you with my daily photos often, but I will share the one for Tuesday 1st January 2015. Of all the scenes that I anticipated might sum up the first day of this new year, this was never one of them.